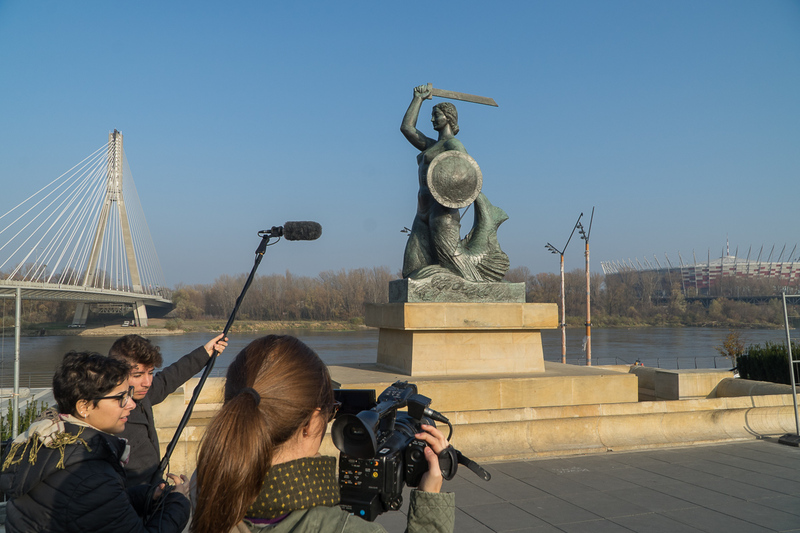 45 participants, 7 days of intensive work, 4 workshop groups, 4 original films shot in Warsaw, Poland – this is how we can summarize the CINEMAFORUM film workshops within the Erasmus+ Programme. The time has come for reflection and summary after the project organized by Youth from France, Italy and Poland took part. Let’s recall November 2018, fulfilled with happy and creative moments spent in a multicultural group. European Youth created short movies, which were the main result of workshops. The enthusiasm of young people was unstoppable, organizational difficulties didn’t manage to cool them down. Loads of organizational activities were necessary to make the exchange happen. Fortunately, young people are able to communicate effectively using tools offered by modern technology, so finally everything was ready on time. Although it was not easy to find the right accommodation, finally they managed to find an optimal option. The Youth have arrived. A VIEW of Warsaw unfolded in front of their eyes. How can cross-cultural integration in Poland look like…? Filmically! Young people formed workshop groups, which task was to create their own films, express themselves and their fascinations. Charged with energy and overloaded with film equipment, they went out into the city streets to explore and shoot them. In the same time, they surprised and captured the attention of citizens interested by unusual activities in the urban space of Warsaw. Common artistic activities let young people from three European countries, with separate experiences and cultural patterns, find a common language – film language. Although it must be admitted that the creators of SEND ME YOUR LOCATION showed the slightly different vision of integration. Young people eagerly entered into the city streets to look for interesting spaces, their fresh experiences became the inspiration for their scenarios. Participants were enchanted by well-known Polish monuments, modern buildings (especially the unusual architecture of Złote Tarasy Commercial Center and new subway stations), as well as historical accents, still alive in the space of Warsaw – such as old buildings, murals and memorials. Warsaw apparently touched hearts of young artists, because it became the main location for of all films. What building is the most characteristic for the capital of Poland? Some people would still like to demolish it, but GIFTS ARE NOT GIVEN BACK. The last day of the project was on Sunday, November 11th. An international group appeared in Warsaw’s KINOTEKA to watch films created by international Youth during CINEMAFORUM final ceremony and to sum up those few days of intensive work that allowed young filmmakers to blossom, nourish their need for creation, meet new people, exceed barriers and create short film thanks to all creative activities. What now? After a few months, the only remaining memories are films, audiovisual souvenirs of international teamwork in the form of postcards from Warsaw – WARSOVIEWS. Collaboration in such group is a source of fresh and unique experiences, a great opportunity to exchange knowledge, ideas and inspiration. We can not wait to be able to cooperate again with young people from different European countries. Check out FILMFORUM website to learn more. Film education program „CINEMAFORUM” was implemented with the support of the ERASMUS+ Program of the European Union. The International Short Film Festival CINEMAFORUM is financed by the Ministry of Culture and National Heritage in Poland and the Capital City of Warsaw. Program partners are: Goethe-Institut in Warsaw, British Council in Poland, Mazovia Warsaw Film Commission, Mazovian Institute of Culture, Warsaw Film School and Austrian Cultural Forum. The organizer of the event is FILMFORUM.